When buying chicken, you may notice boneless chicken breasts bearing the label "with rib meat." 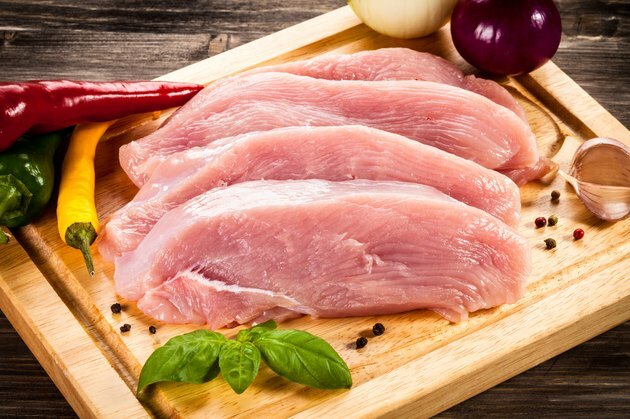 Some boneless breasts have very neatly-defined edges, while boneless chicken breasts with rib meat have an extra piece of ragged meat attached to one side. The rib meat has the same nutritional value as the breast and will likely be unnoticed after cooking; however, trim it away, if you prefer. Boneless chicken breast is the leanest cut on the chicken. As such, it can dry out quickly, if cooked at high temperatures. Use short-cooking methods or methods that incorporate liquid for best results. Pour vegetable oil in a skillet and heat it on medium high. Add the chicken breasts and cook for four to five minutes on each side until golden brown. Add white wine or chicken broth as well as vegetables such as carrots, onions, zucchini, peppers or snap peas. Lower the heat to medium and continue to simmer for another 10 minutes until the chicken is cooked through and the vegetables are tender. Season with salt and pepper and fresh herbs for a quick weeknight meal. Marinade boneless chicken breasts with rib meat in a commercial marinade to add flavor and moisture. Drain the marinade and grill the chicken breasts on a hot grill for 10 minutes, turning after five minutes. The chicken is done when juices run clear and a meat thermometer measures 160 degrees F.
Fill a large stock pot with water and 1 tbsp. salt. Heat the water to boiling and add boneless chicken breasts. Turn the heat to medium low and simmer the chicken breasts for 20 to 30 minutes to poach. The breast meat should be completely white, with no signs of pink. Allow the meat to cool and shred it to use in soups, salads and casseroles. Place chicken breasts in a slow cooker. Add 1/2-cup chicken broth or water and salt liberally. Cook the chicken breasts on low for six to eight hours until the meat is very tender. Cool the meat and shred it.